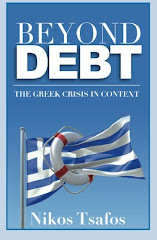 To secure a second bailout, the Greek government is pledging to cut an additional 15,000 public sector jobs by 2012. Such a move is necessary. But Greece also needs a plan to improve the capabilities of the state not just shrink its size. Greece’s state is not too big relative to other European countries, at least not when looking at state spending as a share of GDP: at 44% (excluding interest), the Greek government spends less than the Eurozone average of 48%. Therefore, we cannot frame Greece’s problem simply as “the state spends too much.” Rather, the problem is that the Greek state *wastes* too much, and that the people do not get their money’s worth. At issue is not merely the level of spending but also its efficiency. If Greece got Scandinavian-type services, it could survive with such a big state. But it does not. The core problem is accountability. Simply put, Greece solved a legitimate trade-off with an extreme response. At the turn of the last century, the aftermath of an election would involve the newly elected government firing bureaucrats who supported another party so that it could hire its own constituents into the state sector instead. To stop such a destabilizing practice, Greece instituted a stringent tenure system. But in solving one problem it created two others. First, the practice of firing people ceased but that of hiring did not; as a result, the country had a bias towards higher public sector employment. And second, without the ability to fire people, the state lost its ability to enforce standards. The challenge, therefore, is how to construct a medium path whereby the state does not devolve back into a complete bureaucratic collapse after every election and yet it can reward hard work and punish bad work. And so in the desire to lower government spending, Greece risks devolving into a wholesale reduction in government services and civil servants. Reducing the state must thus be accompanied by three parallel efforts: first, a comprehensive and objective assessment of public sector employees; second, a program to recruit and retain talented people to work for the state (at first in pockets of excellence); and third, a system to ensure that the private sector (for-profit and non-profit) can step in and fill any voids created by the retreat of the state. Greece needs less state but also a better state. I think that comparing state expenditures as % of GDP and using this to compare with other nations is a tricky assertion. This is because GDP is made up of many non cash "revenues". Also I dont think there is an uniform standard in calculating the GDP. A better method for comparison( if the state accounting across Europe can be trusted) is state expenditure of total tax revenue. If the state expenditures are not spent on things which produce an increase in future tax revenue then eventually the state(or a company or an individual for that matter) will be in a position where cannot support its expenditures without borrowing and/or cutting back. By now we all know where that leads to when the entity is run by arms dealers, bankers and politicians giving favors in exchange for votes. Greece ranks much below the average in this instance with tax revenue to GDP of 33.2%(2010 figures from Eurostat)...and spending as Nikos points out 44%. This is where it becomes unsustainable. I agree with the general message of this post. Like the anonymous above, I would, however, like to caution on comparability of public expenditure in relation to GDP. In principle, such data should be more comparable within the EU than for the rest of the world, because Eurostat has developed regulations on national accounts and government finance statistics, which are much more detailed than international recommendations and - in contrast to these - legally binding for EU member states. However, Greek public finance statistics have not been fully reliable in the past (maybe they are better controlled by Eurostat now), and at least in one instance (2006) there has been an unusually large revision of Greek GDP by as much as 25%, based on estimates of the size of the shadow economy, which by their very nature must be rather uncertain. (see for example here. Don't forget that many legal procedures and regulatory requirements now requiring paper filings, services of a notary, and payment using stamps could be streamlined or wiped out completely. Automating procedures, as the State of Tennessee found, allows existing staff to devote more time to other needs, like quality customer service. And of course, another alternative is to layoff redundant staff members altogether. Greece is in need of drastic regulatory reform. By automating procedures, like tax payments and business registration, and reducing physical interaction with clerks and cashiers, opportunities for corruption and significant reductions in time and redtape can be accomplished. Many countries, including FYR Macedonia and Georgia have made major strides in these areas. Why can't Greeks? Indeed, Nikos, there can't be a better future for Greece without finally reducing the ineffiency and corruption inside the administration. That requires to fire the offenders. And that probably can't be done under the stupid tenure law. Imho that's plain to see for everybody with a working brain, regardless of political affiliation. Sadly, Greek politicians on both sides of the aisle do their very best to ignore that. The stagnation in parliament, the total unwillingness to work on the very foundations of the misery, dooms all other reforms. This whole crazy system has to be demolished and rebuild from scratch. But I guess it will take a revolution to achieve that.